Jay Samuels focuses on financing transactions, loan workouts, and bankruptcy. In addition to financial transactions, Mr. Samuels represents clients in real estate and leasing transactions, including representation of a national financial institution in its operational leasing and real estate matters, and in business sale, purchase and general contract transactions. representing a mortgage lender in a Deed in Lieu of Foreclosure Agreement from a developer of multiple urban sites. Mr. Samuels has lectured and written on financing issues for the New Jersey Institute of Continuing Legal Education, the New Jersey State Bar Association and the Robert Morris Association. 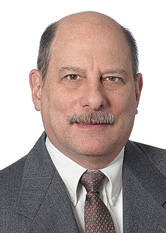 He was a Trustee of the Banking Law Section of the New Jersey State Bar Association for over 15 years, as well as serving as Chair of the Financial Transactions Committee, the Membership Committee and the Program Committee of the Section. Mr. Samuels represented the prevailing party in the case of New Brunswick Savings Bank v. Markowski, 123 N.J. 402 (1991), the seminal decision of the New Jersey Supreme Court on the existence of constitutional due process rights of judgment holders. Nominated to The Best Lawyers in America in the category of Banking and Finance Law (2019 edition).